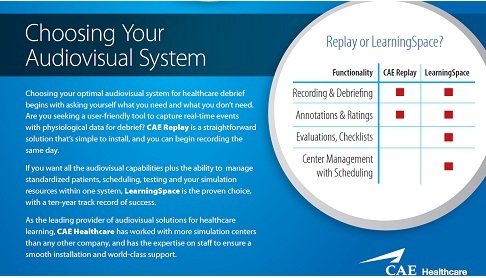 An audio visual recording is a powerful healthcare simulation debriefing tool. Recognition of its value to the learning environment is increasing every day. Which Audiovisual Solution is Right for You? Annotated, segmented, and chronologically organized video content can positively impact learning in several ways. Here are just three of the most relevant we've found. Annotated simulation video permits the instructor the ability to identify precise moments and specific behaviors for review. This creates an immense opportunity for advanced learning and deeper engagement. Learners get to see where they performed well, or where they may have erred, and this creates an immense opportunity for deeper engagement and advanced learning. As healthcare learners watch and review video playback of a simulation, they may begin to experience heightened levels of observation, interpretation, reasoning, and understanding. Not only do they notice certain things about their own behaviors, but they also develop better understanding into the behaviors of their team members. With annotated video, instructors can identify deficits in team performance, lapses in procedural compliance and breakdowns in crew resource management (CRM) and communications. Careful review of these particular moments provide the seeds for improving team-based communications and adherence to professional protocols. Contact CAE Healthcare to learn more. *Bossewitch, Jonah S., Preston, Michael D.(2011). Learning Through Digital Media: Experiments in Technology and Pedagogy (Chapter 19, Teaching and Learning with Video Annotations). Institute for Distributed Creativity. Premkumar, K. , Cowie, N. , Coupal, C. & Boechler, K. (2013). Software for Annotating Videos—A Resource to Facilitate Active Learning in the Digital Age. Creative Education, 4, 465-469. doi: 10.4236/ce.2013.47067. Grant, J. S., Moss, J., Epps, C., & Watts, P. (2010, September). Using Video-Facilitated Feedback to Improve Student Performance Following High-Fidelity Simulation. Clinical Simulation in Nursing, 6(5), e177-e184.